As I approach another notch in my chronological belt, I find myself increasingly determined to not settle into my middle years, rather inspired to make each year meaningful. As mother to older children, I am now afforded the precious luxury of more time. More time to reflect, to create goals, to make a difference. Predominant in my recent reflection is a growing dissatisfaction with my current career, often referenced as the 'blasted day job'. At the end of a day, a week, a year, the expended energy, time and effort I have committed leaves me empty. I crave opportunity to become involved, to make meaningful contributions to my community, to reach out a hand to one in need. With a demanding work schedule as well as a calendar of family events and commitments, it has been far too easy to push my nagging thoughts into the 'I'll think about it tomorrow category' as another year ticks by. Although a full career change will take some time, making a difference now is SIMPLE, requiring only the barest of efforts and an open heart. The Champions for Kids program is specifically designed to enable those with unrealized passion for giving to make a difference in their communities. With SIMPLE Service Projects already designed and easy to facilitate, even those with the busiest of schedules can participate. Whether performed by an individual, a family or a school or church group, these projects target the most deserving of our communities in ways that can make a powerful impact. 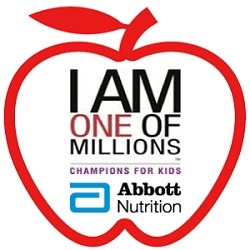 Participating in the Abbott Nutritional Champions for Kids Pack a Snack project has been a rewarding, although heart-wrenching, experience for my family. With aim to address the hunger needs of children with quality food items, my family selected products with high nutritional content, such as PediaSure® and Zone Perfect Bars®, along with easy meal staples to donate to a local shelter. The education my family gained from exploring the devastating and prevalent issue of childhood hunger and homelessness across the nation and specific to Michigan was, at once, heartbreaking and inspiring. GATHER your family, friends, and co-workers and ask them to bring nutritious foods like Pediasure®, Pediasure SideKicks®, and ZonePerfect® bars to help children in need. GIVE the nutritious food to a school, church, food pantry, or non-profit organization in your community. These organizations need snacks and meals for children who do not get enough nutritious food on a daily basis. This food doesn’t just help children have enough to eat – it helps them have happier and healthier futures. Join me and become One of Millions, reaching out to those in dire need in your community! Inspired and rewarded by my family's individual contribution to our local shelter, we are reaching out to one of the groups we are active in, the Destination Imagination group in which my son participates and in which I am a team leader to collect even more nutrition packed items to donate. With all teams gathering in February for a practice session, what better time to ask each member to bring a contribution that will make such an impactful difference in the life and future of a child in need. What a fabulous program! Thanks for sharing about Champions for Kids! I love reading about all of these giving missions! And it's SO important to keep spreading the word so that more and more people will start giving so that there will be less and less suffering! Good for you! I am so glad that we got to take part in this program - I can't wait for the next Simple Service project to reach kids in our community! These projects are such a fabulous way to get involved in our communities. I hope that readers start to do their own simple service projects too! Thanks for sharing this! I hope more people decide to get involved in their own communities! This is a wonderful way to share in the community. I hope this is the year we all decide to get involved. When I worked in the school system I was often amazed how many of our students came from the shelters because their families were homeless. It is a worth while goal to help. It's so sad when children suffer. Praying for every one! I love this program. They make giving so attainable. Anyone can do it really :D Thanks for sharing!